Two sailors injured in a bomb blast in the far south earlier this month were rewarded with cash and promotions at a ceremony in Sattahip. 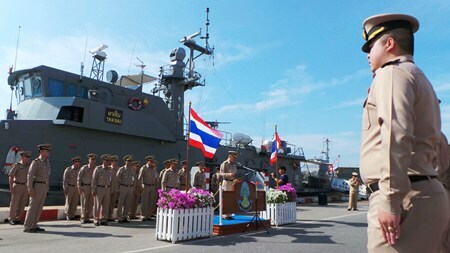 Vice Adm. Tanakan Kraikruen and Rear Adm. Somkit Timsad, director of Queen Sirikit Hospital, presented compensation to Petty Officer 1st Class Supphakrit Lerkkasem and Seaman Anan Pansiri July 14. The navy also will cover their medical expenses and promote Supphakrit two ranks to Petty Officer 3rd Class. The two sailors attached to Narathiwat Special Task Force Unit 32 were injured July 9 by a bomb attack in Si Sakhon district of Narathiwat province. Vice Adm. Tanakan Kraikruen reads an accommodation of bravery for injured Petty Officer 1st Class Supphakrit Lerkkasem. The explosion occurred while Supphakrit and Anan were patrolling Highway 4066 between Talo Halo and Ban Palo Pata. Both received shrapnel wounds and were treated locally before being transferred to Queen Sirikit Naval Medical Center in Sattahip. Vice Adm. Tanakan Kraikruen and Rear Adm. Somkit Timsad, director of Queen Sirikit Hospital, present compensation to Seaman Anan Pansiri.